Why Christ in You is Great News! Recently, I read about the great Italian violinist Paganini. One night as he stepped onto the stage he realized he didn’t have his best, most valuable violin. He quickly scurried backstage to see if he could find it, only to discover that someone had stolen it and left a cheap, less valuable violin in its place. Paganini stepped back on stage with the cheap violin and told the audience, “Ladies and gentlemen, I will now demonstrate to you that the music is not in the instrument but in the soul.” He then played with his whole heart, making beautiful and enchanting music that left the audience spellbound. I don’t know about you, but I often feel inferior. I long to play beautiful music with my life that points others to the majesty of Jesus Christ. Here’s the thing—though I am an inferior instrument, the core music is not created by me. It is played through me by Jesus Christ who is now the essence of my life. If Christ lives in me, I don’t have to worry about being weak. He delights to use what’s weak to confound the world. He promises that my weakness is turned into strength by His Spirit (2 Corinthians 12:9). He loves to play His beautiful music through my very inadequate self. If Christ lives in me, I have all the power of the resurrection available to me. At different points in my life I’ve thought, “I’m not changing fast enough! I want to be like Jesus. How can I try harder to be like Him!” Ever had those thoughts? Here’s the thing: we don’t have to “try harder.” We only have to cooperate with the resurrection power that is available to us 24/7. When temptation comes, we simply press in to Jesus and ask for His power. Colossians 3:12-14 describes what our attitudes will be like as we set our hearts and minds on Christ and His resurrection power flows through us. We need only to cooperate with that power. The result—beautiful music! If Christ lives in me, the peace of Christ rules in my heart. The peace of Christ as ruler in my life makes the most beautiful music! (Colossians 3:15-16). It is a harmony of calm in chaos, forgiveness in the face of hurt, and joy in the journey. It results in gratitude, thanksgiving, and praise to our God. As that music flows out of us, others are drawn to the melody of peace. The bottom line is this: are you inadequate? Yup, you sure are? Me too! But is Christ able to play beautiful music through inferior instruments? You bet! 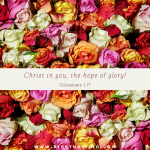 The best news of your life is Christ in You, the hope of Glory! Celebrate that music of life with Him! I will be traveling to Portland this week for a family wedding. Thank you for praying as I spoke at Foothills last weekend! God did a lot! Thank you for praying for Steve as he has traveled around North Africa. He’s heard many great stories and has had a great vision-casting trip for work in that area. Please pray for Steve and me as we write Listen Well, Lead Better!,a book for leaders! We’re excited!